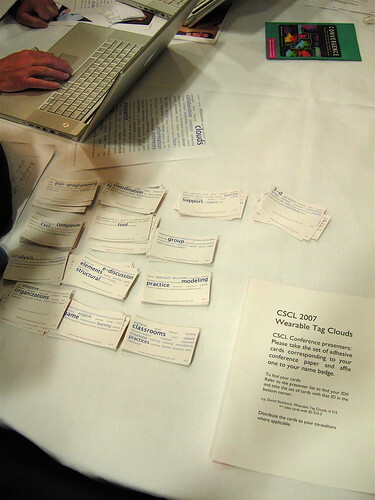 I created text clouds for all 147 presenters at the CSCL 2007conference based on the abstracts of their articles. The clouds are printed on stickers so attendees can pimp out their conference name badges with at-a-glance visualizations of their research interests. The clouds act as "social (software) lubricants" to facilitate introductions and conversations throughout the conference. This was the second major prototype of wearable tag clouds; the first was back at Stanford.